Approx cost: 1,200 UK pounds. If you have been into hi-fi for any length of time, you will no doubt, like me, have seen countless examples of loudspeakers. The vast majority are the boxed type, and let's be honest, share a fairly common design, no matter what the advertising may try to tell us! 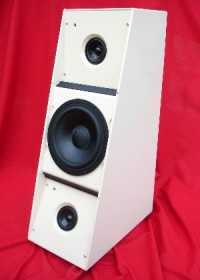 So when I spotted the Adorn Concerto 3 loudspeakers on the Internet, I was immediately attracted by their unusual design. First and foremost, the Concertos don't have the usual wooden, or MDF, cabinets. Instead they are very solidly constructed from steel and weigh in at a massive 40 kilos each. Fortunately, they are a relatively small design, and the lady of the house can dust around them rather than having to move them! Tapping the cabinets confirms just how solid and 'dead' they are, and their 9mm diameter spikes keep them rock steady. At just 70 cm high, they should fit comfortably into even the smallest of listening rooms. And after my massive open-baffles, I have to admit that it was nice to have so much of my room-space back again! The front baffles are sloped back to angle the drivers up, and this 'raises' the sound stage up to a normal height. The review samples supplied came in a cream colour that I found to be a bit bland. However, Adorn sensibly offer the customer the finish of their choice so even the fussiest of buyers (or their partners) should find the Concertos aesthetically pleasing. Such build quality comes at a price though. 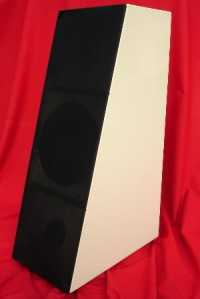 Suffice to say that it raised my eyebrows when I heard the materials cost of these loudspeakers! The driver line-up is also a little different from the usual woofer and tweeter. Two Visaton three-inch full-range drivers handle the upper frequencies while the lower range is covered by a high-quality eight-inch driver that sits between the two full-range drivers. Adorn have cleverly avoided the use of any capacitors in the crossovers for these speakers, thus removing a potential source of distortion. Each three-inch driver is in its own ported enclosure while the woofer is accommodated in a specially shaped section, that is also ported. Changing from large open-baffle speakers to a small boxed variety, I expected that it would take a little while to adapt to the different sound. But at first I found the Concertos really disappointing, particularly so for a speaker in their price range. In fact, I was beginning to worry about what I would write for this review! I had them connected to a class-T amplifier that in turn received its signal from a valve pre-amp. Adorn had strongly recommend bi-wiring their speakers but I had temporarily connected them up with single runs. I have tried bi-wiring in the past and found that it made only a marginal difference but I felt it only fair to try it. The difference was night and day! Obviously the 'isolation' that is provided by the length of speaker cable (or its resistance) makes a lot of difference! It seems that there is something about the design of the Concertos that requires them to have some isolation between the woofer and upper frequency drivers! Running each section separately, I noted that there is a comparatively large overlap of each frequency range. Whatever the reason, it seems that bi-wiring is mandatory, and bi-amping is preferable. Bi-amping shouldn't put anybody off as good quality amplification, in the form of something like a Gainclone or class-T amplifier, is now quite affordable! I wondered how much bi-amping would further improve the Concertos so I hooked up a second amplifier. This improved the Concertos again, the sound stage growing both wider and deeper. Once the Concertos are bi-wired or bi-amped, they really start to perform as they were intended to! I found them unfussy as regards placement (probably a good thing as you wouldn't want to be moving them round a lot). About 450 cm from the back wall works well in my room and I found that they will work well toed in or parallel with the side walls. When toed in toward the listening position however, the sound is slightly more focussed. Probably the first thing that I would say about the Concertos is that they are enjoyable to listen to. I didn't find anything to play that I didn't enjoy. They are not the most analytical of speakers as you may imagine without a dedicated tweeter but that can be a positive as it 'takes the edge off' some poorer recorded material. The frequency range for the Concertos is quoted as 20 Hz - 20 kHz on Adorn's web site. I haven't measured them as my rather basic sound meter is not accurate at the frequency extremes, but I would say that those figures are a little optimistic. Compared to my open-baffles with their large transmission-line woofers, the Adorn's don't go quite as deep. Nor do they go quite as high as my baffles that have a helper tweeter. In fact they remind me of my full-range drivers minus the tweeter! But if the bass isn't the lowest, it is of the highest quality. I found bass lines clearly defined but not obtrusive, fast and tuneful and very addictive. Those carbon fibre woofers in their rock-solid metal enclosures produce some of the tightest bass that I have heard from a boxed speaker! Listening to CD's such as 'Dub Side of the Moon' and 'Outrospective' was addictive! The Concertos are all but acoustically invisible when they are playing. The music stretches from one wall to the other and I soon became unaware of the speakers altogether. For three-inch drivers, the sound stage was large and, with the right material, quite deep as well. Adorn talk of 'engaging, atmospheric detail' and 'Superior ambience', and there is a sort of atmosphere around the sound that is hard to describe. It's not the three dimensional effect that I get with my open-baffles but there is some ambience that you don't get with many other boxed speakers. I would describe the overall sound of the Concertos as 'polite'. They never seem to offend, no matter how hard you pump up the volume. This is probably due to not having a tweeter, or more specifically, a tweeter with a capacitor in the crossover that causes distortion. I find on some systems, the voices of artists like Patti Griffin and Natalie Merchant can sound a bit harsh but there is absolutely no sign of that with the Concertos. Adorn recommend, and I would agree with them, the use of silver, or silver-plated, stranded cables for the top section of the Concertos. These are not the most transparent speakers that I have heard but detail is clear enough. Tape hiss on some older recordings is clearly audible but it's more in the mid-range that I noticed a slight veiling of the sound, but only with a few recordings. This was more obvious on some recordings than others. For instance, I played Van Morrison's, Avalon Sunset and found the vocals a little 'recessed'. Wondering if this was something to do with male vocals, I tried Chris Rea's 'Dancing With Strangers' CD but didn't find the same problem. Certainly, on less complex pieces of music, there is no lack of any mid-range precision. Both Norah Jones albums, for instance, were fine, as were those of Diana Krall and Stacey Kent. I was interested to hear how this unusual driver arrangement would handle the Q sound effects on Roger Waters album, 'Amused to Death'. Happily, all those little sound effects turned up in the right parts of the room. As a bonus, some of them, like the coach and horses, appeared much larger than I have heard them on other speakers. I enjoyed this album immensely through the Concertos! Another strength of the Concertos is their ability to accurately reproduce percussion. Listening to Joan Armatrading's, 'Me, Myself, I' CD, the drumming sounded particularly good with each beat crisply heard through the rest of the music. I think that it is this ability to do justice to percussion, allied to the fast and clear bass, that makes the Concertos so addictive with some music. I repeatedly put on single tracks to audition and found myself compelled to listen to the rest of the album. When Adorn delivered the Concertos, they brought with them some test CD's, most of which were classical music. I tried a lot of classical material and once again found myself drawn into the music. Engaging is the word I would use, whatever I put on I had to listen to until it finished. Although they will play most types of music well, I would say that the Concertos are aimed at the listener of classical music! There was a sense of 'being there' with most of the classical music that I listened to. Orchestral performances were spread out across a large sound stage although I would say that on my reference recordings, each section of the orchestra was not quite as clearly pin-pointed as I have heard with some other speakers. Summing up, the Concertos are competent speakers that can play just about any type of music well. That said, I would suggest that their presentation is geared toward the listener of jazz, acoustic type music, or particularly classical music. I listened to a much higher percentage of classical music while I was reviewing the Concertos than I do normally, everything from early Baroque to Ronald Binge. Whatever the Concertos are doing, they make this type of music immensely enjoyable. The Concertos are musical speakers rather than hi-fi speakers! I say that because the slightly restrained top frequencies don't provide that edge-of-the-seat excitement that you may get with a speaker using a dedicated tweeter. Before you take that as a negative, you should remember that this aspect of the Concertos can also make some recordings more 'tolerable', so it is down to how you like your music, and what you listen to, as to whether the Concertos will appeal to you. They are all-round performers with perhaps a special mention required for their bass quality. Like just about any other speaker, the Concertos have some weaknesses but given that they are so enjoyable to listen to, most listeners will quickly forget their few foibles. To put it another way, the Concertos are a speaker aimed at the music lover rather than the obsessive audiophile! With their excellent build quality, diminutive size, and the option for the buyer to order the finish of their choice, they should appeal to even the most begrudging partner. They certainly look better with their grills on, and after a few days listening without them, I didn't notice any degradation of the sound quality when I put them in place. All in all, a loudspeaker that is well worth auditioning, particularly if classical music makes up the bulk of your collection; more so if music is more important to you than hi-fi! Adorn's designers should be complimented for not following the crowd, trying a different approach, and producing a compact speaker that provides such an enjoyable listening experience!